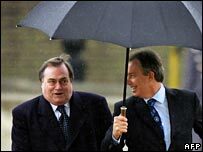 Deputy Prime Minister John Prescott was "not happy" he found out about millions loaned to the Labour Party by reading it in the papers, he has told the BBC. He told Sunday AM he believed the controversy would lead to state funding of political parties, which he backs. 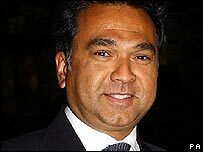 Newspapers report a fourth lender, Sir Gulam Noon, has now been blocked from joining the House of Lords. Polls suggest a majority of people believe peerages have been offered for cash and that Labour is "sleazy". Labour was secretly loaned almost £14m by wealthy individuals ahead of last year's election. Mr Prescott insisted the loans would later appear in the party's audited accounts. Not declaring loans does not break any rules but the government is under pressure to show no one was promised honours in return for cash - a claim ministers have denied. In a YouGov poll for the Sunday Times, 56% of people said they believed the prime minister had given peerages for money, while just 14% thought he had not. Among Labour supporters, only a third accepted the prime minister's word that he had never given peerages in exchange for cash. The poll surveyed 1,811 people. Another poll for the Sunday Telegraph found that seven out of 10 people thought Labour was as "sleazy" as the scandal-prone Tories under John Major. In the ICM poll of 1,003 people, just under half said they believed Labour had offered peerages in return for big loans. Former cabinet minister Clare Short told Sunday AM the controversy was turning "ugly". Liberal Democrat leader Sir Menzies Campbell told ITV1 the row damaged the "whole of the political process". As well as Mr Prescott, party treasurer Jack Dromey has said he knew nothing about the loans. Also talking to Andrew Marr on Sunday AM, shadow chancellor George Osbourne said the Tories wanted to "clean up British politics" by putting a cap on large donations to political parties. He said it would help "remove the suspicion" that large sums of money could buy influence over policy. A full announcement on his party's proposals would be made on Monday, he said, adding that the proposed upper limit would be in the thousands. On Sunday Mr Prescott refused to give a guarantee that Labour had not given peerages for loans. "I am bound to say not all the information possibly is out yet and we are still looking at it," he said. Mr Prescott said he favoured a change to state funding but also said he would not rule out the suggestion that private loans should be capped. "There's a kind of unhealthy approach to political financing in this country. What we need to do is have a healthy debate. "To my mind it'll lead to the conclusion of state financing. I think there is an argument for capping but I think all the political parties certainly need to sit down...and come to a decision so we can have healthy financing for a healthy democracy." The chairman of the Committee on Standards in Public Life, Sir Alistair Graham, said the affair exposed "a lack of honesty and transparency". He also suggested that there were "issues" surrounding potential breaches of the ministerial code. Sir Alistair told BBC Radio 4's The World This Weekend programme: "The problems have come because of a lack of honesty and transparency in some of the arrangements that have been made. "This government clearly is in danger of attracting the sleaze label that was so clearly pinned on the previous government." The prime minister has already appointed Sir Hayden Phillips to discuss election funding with all political parties. Labour party chairman Ian McCartney said: "The danger of the Conservatives making their own recommendations tomorrow is that, under the guise of objectivity, they produce proposals that are significantly to their advantage and seriously disadvantageous to all other political parties. "That is why the government has said we should seek a level playing field." One businessman who loaned the Labour Party £1.5m has said he is happy to appear at a Commons inquiry into the giving of honours to political donors. Dr Chai Patel, who heads the Priory rehabilitation clinics, is among donors who lent the party more than a million pounds and whose names were put forward for places in the Lords. The Lords Appointment Commission has not denied reports Sir Gulam Noon's name has been blocked because of a secret loan. Multi-millionaire Andrew Rosenfeld has now confirmed that he loaned £1m to Labour in the run-up to last year's general election. The 43-year-old said he was "delighted" to show his support and added that he loaned the money because of Labour's "genuine commitment" to child welfare. Mr Rosenfeld is chairman of the National Society for the Prevention of Cruelty to Children's FULL STOP campaign.